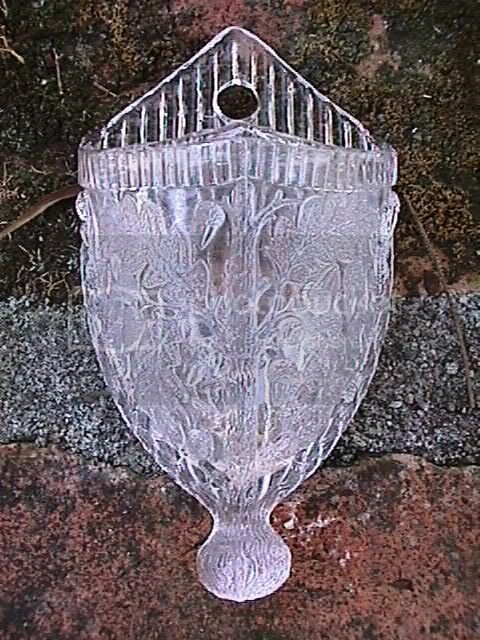 I have small wall pocket in clear glass with a design of a tree with acorns and oak leaves, it is 5" from top to bottom and 3" wide. Can anyone help with an ID thank you. Tony â€” This wall pocket is difficult. The most obvious attribution is Burtles Tate, particularly as the oak leaf decoration was also used on their boat, Rd. No. 29106 of June 29, 1885. The opalescence also matches other BT products. However it could be M&W or Greener. I doubt whether anyone today could be certain. Thank you for your comments, just to let you know my wall pocket is in clear glass the opalesenceant look is a trick of light. Tony â€” I meant to say that opalescent/pearline (with a small "p") examples I have seen have matched Burtles Tate known pieces. On balance I am fairly confident about a BT attribution. I apologise for my indecisiveness and lack of clarity last week â€” I was not on my usual form.